This handbook offers an ideal reference for individuals and organizations involved with the production of food, from both agriculture and horticulture. Designed to be accessible for those who normally speak or read English as their second language, it offers thorough explanations and numerous cross references to the terminology, acronyms and technologies used. 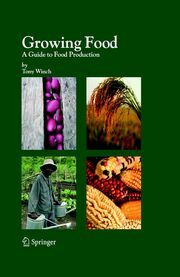 The book answers basic questions about how food is produced from plants and aims to demystify the subject of growing food. The focus is firmly on the technical aspects of food crops, animal husbandry, agrochemicals and genetic engineering are only briefly mentioned. Tony Winch was born and raised on an agricultural research farm in Kent. After graduating in 1971 from Wye College (London University) with a BSc (2.1) in Agricultural Economics he worked for a number of years in the commercial seed trade in the UK, Brazil, Canada and North America.Since 1980 he has worked in the agricultural aid and development sector, employed by a number of agencies to work as an agricultural consultant in Somalia, Sudan, Ethiopia, Mozambique, Angola and Afghanistan. When he is not overseas he liv es in Herefordshire, UK and attempts to feed his family as far as possible from the garden.